I actually don’t remember how I came upon World Bank economist Branko Milanovic’s (2010) The Haves and the Have-Nots and decided to buy it, but I’m very glad I did. Despite the cheesy name, Milanovic’s book is a really excellent overview of global inequality with an innovative structure that mirrors the problem at hand. The book contains three essays and 26 vignettes. The essays deal with three aspects of inequality: within-country, between-country, and global (trying to examine the distribution for all individuals in all countries). They are very readable – you could easily assign them to first-year college students – and explain both the history of studies of inequality as well as some of the complexities of measurement and data availability. Each essay is followed by 7-10 vignettes that range from deathly serious to a bit silly, such as the analysis of where Mr. Darcy would have fallen in the income distribution of early 19th century England. Along the way, Milanovic addresses the pressure for migration in the contemporary world, inequality under socialism and capitalism (and how between region inequality was a problem for the USSR, and may yet be a problem for China), and more. The scope is delightfully wide, but Milanovic has pretty historical and sociological sensibilities for an economist which makes the endeavor feel much less imperialistic. By the 1900s, then, it was no longer so true that workers in England and Germany had similar standards of living to workers in Russia, and between-country inequality only got worse over the 20th century. Workers in Germany, in other words, had something to lose other than their chains at the time of the Russian revolution. Which leads us to the present, and another nice quote from Milanovic. 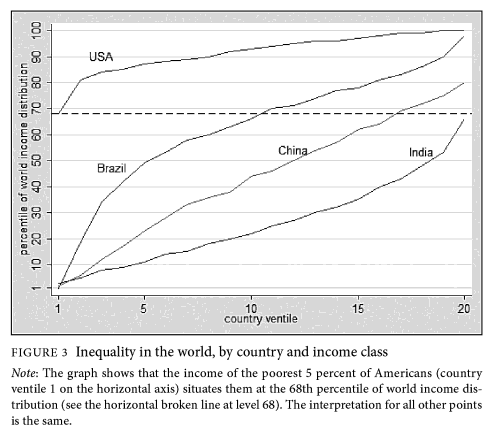 In vignette 2.2, Milanovic shows a graph of income ventiles (groups of 5% of the population) for the USA, Brazil, China, and India (reproduced below). Social scientists, sociologists included, tend to think about within-country inequality and stratification and focus on big predictors like race, gender, and parent’s socioeconomic status or class. But in a global perspective, nationality dominates all of these variables as a predictor of income. At least, it does in the 21st century. That between-country inequality dominates within-country is not an eternal truth, however, as Milanovic reminds us. And what does high between-country inequality imply about a just immigration policy? keep up the good bloggin Dan! Milanovic actually discusses immigration at some length in the vignettes, focusing especially on immigration at four places in the world where countries with extremely different average levels of income border (e.g. Mexico/US, Spain/Morocco, etc.). He actually motives the discussion of global inequality partly in these terms: even though immigration is still pretty small, it’s very politically salient, and our imagination and media are quite global, so our potential for upward mobility, and our relevant reference groups, are more global than ever. And he argues that as long as large-scale poor-to-rich immigration remains politically unpalatable in rich countries, we’re going to need to work on developing poor ones. So, read the book for more!